KUALA LUMPUR (Feb 12): Cash-rich ECM Libra Financial Group Bhd (fundamental: 1.35; valuation: 1.2) is buying a 12.4% stake or 12.79 million shares in Educ8 Group Sdn Bhd, which is controlled by Tan Sri Tony Fernandes and Datuk Kamaruddin Meranun, for RM12.79 million cash. In a filing with Bursa Malaysia today, ECM Libra said the move is in line with its intention to grow its private equity portfolio, where it has considered the prospects of Educ8 and the private education sector and believes that it can contribute positively to its private equity portfolio. The Educ8 subscription is expected to be completed in April this year. ECM Libra plans to fund the subscription of Educ8 shares in several tranches between February and April this year. It added that it will appoint one director on Educ8's board to represent its interest. Educ8’s wholly-owned subsidiary Epsom College Malaysia Sdn Bhd operates a purpose-built boarding school Epsom College Senior School in Bandar Enstek, Selangor. The college offers primary and secondary education, which follows the British syllabus, and it currently has 192 students. Educ8 counts Fernandes as the largest shareholder with a 38.9% stake, followed by ASIG (31.6%), Kamaruddin (26%), Sesama Education (1.8%), Rezeki Bahagia (1.1%) and Epsom College Ltd (0.6%). Following ECM Libra’s entry into Educ8, Fernandes’ shareholding in the company will be diluted to 33%, ASIG (29.5%), Kamaruddin (22.1%), Sesama Education (1.5%), Rezeki Bahagia (1%) and Epsom College (0.5%). ASIG is controlled by ECM Libra's non-executive director Lim Kian Onn via Plato Capital Ltd. Lim also sits on Educ8’s board. For the financial year ended Dec 31, 2014 (FY14), Educ8 saw its net loss narrowed to RM2.83 million from RM5.07 million in FY13, while revenue rose to RM4.82 million from RM26,000 the previous year. Educ8 attributed the smaller FY14 net loss to the college starting its operation in September last year, boosted by the revenue generated from tuition and board fees. ECM Libra fell into Practice Note 17 (PN17) status in December 2012 after it had disposed of its investment banking operation to Kenanga Investment Bank Bhd for RM875.11 million. Its PN17 status was uplifted on May 28, 2014. The group is controlled by banking tycoon Tan Sri Azman Hashim, 76, with a total stake of 27.58%, while Lim holds another 21.48% equity interest. 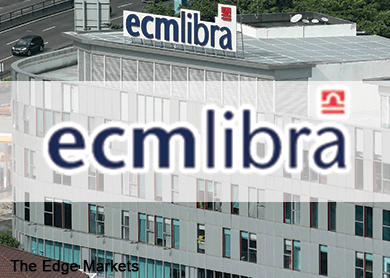 ECM Libra's share price has appreciated 20% from 90 sen on Dec 17 last year to close unchanged at RM1.08 today, giving it a market capitalisation of RM289.8 million.